This was a great book. I really did enjoy it. The story is of a wealthy boy in Kabul, Afghanistan and a servant boy at his home who become friends. The wealthy boy pines for his father's affection (his mother died giving birth to him) but he never fully gets it (or his dad's approval). The boys are each other's playmates until they are about 10 when something terrible happens to the servant boy. The wealthy boy witnessed it, but ran instead of helped. And the wealthy boy never saw the servant boy again. 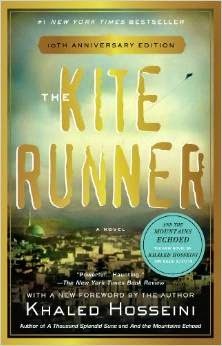 The wealthy boy moves to America with his father when the Taliban takes over Kabul and there he finds college, a wife, and a new life. Until one day, he gets a call from an old family friend asking him to return to Kabul because he has to see him. And this is where I will end my review because I do not want to give away what happens when he returns. It really was a great story. I found myself gripping the book tightly in the end. I wondered what had happened to the servant boy and if the wealthy boy would ever see him again. I encourage you to read this book. There is even a movie that goes along with it!